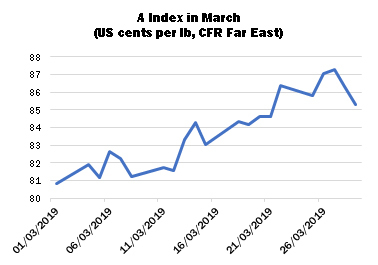 International cotton prices broke out of their recent trading range during March, influenced by a (largely speculator-driven) rally in New York. Futures settlements were on an upward trajectory throughout most of the month, and this was reflected in shippers’ offering rates. The Cotlook A Index started the period just below the 81-cent mark and on March 27 touched a high point of 87.30 cents per lb, before suffering a late setback. An Index in the mid to high 80s is still well above its long-term average. For much of the period, market sentiment continued to be affected by shifting perceptions of the progress of trade talks between the United States and China. Since July last year, US cotton shipments to China have been subject to an additional tariff of 25 percent. As a result, new US sales to that market have been of modest proportions, and frequently offset by cancellations, as was the case during March. Overall, US export sales reported during the month nonetheless sustained a fairly good tempo. Shipments picked up some pace but by March 21 remained short of 50 percent of USDA’s forecast for the season, unchanged in the Department’s March supply and demand report at 15 million bales of 480 lbs. The impact on trade flows of the US-China dispute remained apparent in trade data released during March. 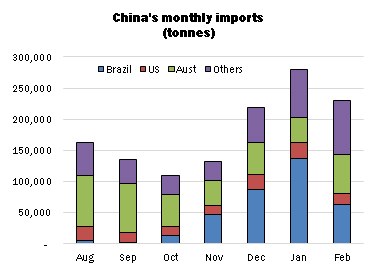 Australia and Brazil each accounted for about 27 percent of Chinese imports in February, with the US relegated to a distant fifth place with just eight percent. Raw cotton imports during the first seven months of the international statistical season increased to nearly 1,268,000 tonnes – already on a par with the volume shipped during the whole of the previous marketing year. The US was China’s single largest supplier in 2017/18, claiming about 45 percent of imports. Some at least of the arrivals reaching China over recent months are believed to be destined for the State Reserve, the intention being no doubt to ‘rebalance’ the quality composition of the ageing government-owned stocks, a substantial proportion of which is thought to consist of rather undesirable qualities produced outside Xinjiang. Beijing’s intentions with regard to the disposal of additional quantities from the State Reserve remains a subject for conjecture. In 2017 and 2018, a six-month auction series began in March, having been announced in early January. No such notice has been given so far this year, but it has been reported that quality inspections have begun, lending some credence to the idea that this year’s auctions could commence around May. For the time being, however, China’s spinners have no pressing need of State Reserve cotton, as local ‘commercial’ stocks (those outside the State Reserve and excluding mill stocks) remain abundant. Despite the comfortable supply position, Chinese import enquiry remained in evidence during March. Although international prices strengthened in March, import offers continued to offer a substantial price incentive in relation to those quoted for domestic cotton. Buying involved both shipment cotton and lots offered from consignment stocks held at various ports. For most of the month, mill demand from most other markets proved of fairly routine proportions, as spinners remained reluctant to meet steadily increasing offering rates, without any commensurate improvement in yarn selling rates. The sharp fall of prices during the second half of last year has left many spinners with high-priced raw cotton purchases to digest, while yarn prices have tended to stagnate. In consequence, to the consternation of the trade, some spinners have sought to negotiate delayed shipment of some of those earlier purchases, while covering their short-term needs at more advantageous prices, in an endeavour to lower their average raw cotton replacement costs. The price outlook for the later months of the year has meanwhile moved into somewhat sharper focus as planting intentions in various parts of the world have become better defined. Before the major Northern Hemisphere crops come to market, movement of Brazil’s bumper 2019 crop will have begun. During March, the official production forecast was increased slightly further, to 2,575,400 tonnes, which would mark a new record and an increase of no less than 28 percent from the previous season. Strongly rising production has posed certain logistical challenges for Brazil. Following two months of strong shipments in November and December, export volumes faltered somewhat in January and February. The figure for March is awaited with interest for signs that shipments have regained momentum, and that a burdensome carryover can be avoided. 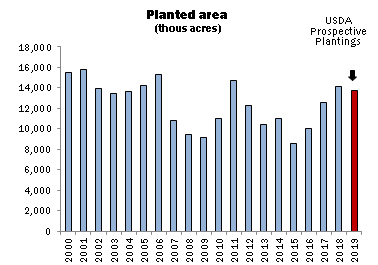 During the early months of the year, the received wisdom has been that US cotton area is likely to increase in 2019/20, a notion supported by the results of the National Cotton Council’s Planting Intentions survey, released in February. However, on March 29, USDA’s own Prospective Plantings report yielded a forecast of cotton area in 2019/20 that proved well below most trade expectations. The Department forecasts cotton area at 13,780,000 acres, against the 14,099,000 sown last season and the 14,449,000 indicated by the National Cotton Council’s February survey. The largest discrepancy concerns Texas, for which Washington’s figure, at 7.3 million acres, is 574,000 lower than that advanced by the Council. Futures rose sharply following release of the planting figure and ensured that the market ended the month on a decidedly firm note.